A number of roster moves were made at the end of the season. Henry Owens was outrighted off of the 40-man roster and claimed off waivers by the Arizona Diamondbacks. The tall left-hander continued to struggle mightily in the Arizona Fall League with his control while working from the lower arm slot he debuted mid-season. Since being selected 36th overall in the 2011 draft, Owens appeared in 162 games in the Red Sox system. He was the 2013 SoxProspects.com Pitcher of the Year and was given postseason All-Star recognition by the site four times. In addition to Buttrey and Shepherd, left-handed starter Jalen Beeks was added to the 40-man, protecting him from selection in the Rule 5 draft. 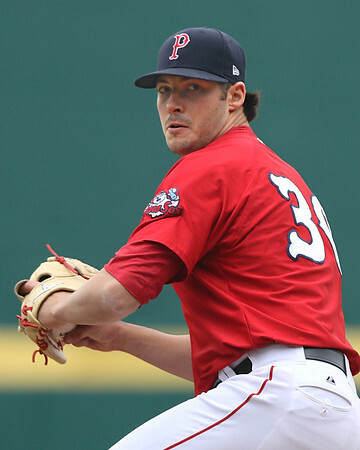 Beeks was outstanding between Portland and Pawtucket in 2017, posting a 3.29 ERA and striking out 155 batters in 145 innings pitched and winning the SoxProspects.com Pitcher of the Year honors. Outfielder Bryce Brentz and left-handed relief pitcher Williams Jerez had previously been added to the 40-man roster before hitting minor league free agency. The team signed diminutive, 25-year-old infielder Esteban Quiroz as a minor league free agent out of the Mexican League. The five-foot-seven Quiroz hit .293/.428/.488 for Yucatan while splitting time between second base and shortstop. Boston had success last offseason signing Hector Velazquez from the same circuit. Boston also re-signed a trio of their own minor league free agents: outfielders Aneury Tavarez and Jeremy Barfield and right-handed swingman Marcus Walden. In addition to hitting 27 home runs in only 384 plate appearances with Double-A Portland, Barfield, who once converted from hitting to pitching in the Oakland system before moving back to the outfield, delivered the best tweet of the 2017-18 offseason. A few ex-Sox prospects around the league were added to the 40-man rosters of their respective teams as well. Mauricio Dubon (Brewers), Luis Alexander Basabe (White Sox), and Gerson Bautista (Mets) were all protected ahead of the Rule 5 draft. Nick Longhi was considered likely to be added by the Cincinnati Reds before suffering an elbow injury that required Tommy John surgery in August. As for those left unprotected from the Rule 5 draft, JJ Cooper at Baseball America lists Justin Haley and Trey Ball as among the Red Sox' potential candidates for selection later this week, as well as old friend Jose Almonte of the Diamondbacks. The graduation of Rafael Devers elevated 2016 first-round pick Jay Groome to the top of the rankings. Groome's overall stat line from this past season seems inauspicious, but there were significant successes. Challenged with an initial placement in the South Atlantic League, Groome struck out 58 batters in 44 1/3 innings at the level. His overall line also suffered from a disastrous first start of the season, during which he strained his oblique and allowed nine runs in 1 1/3. Alex Speier of the Boston Globe reports that Groome is living in Fort Myers this offseason and training with Chris Sale, as evidenced in this Instagram post. Rankings, roster moves, and fall league baseball have been central themes during the SoxProspects.com Podcast. You can find them on our podcast page. The Greenville Drive, champions of the South Atlantic League, were awarded the 2017 John H. Johnson President's Award as the top franchise in minor league baseball. The recognition is based on "contributions to baseball in the community, promotion of the baseball industry, financial stability and contributions to league stability." The Drive are the first ever recipients from the venerable South Atlantic League, and the first Red Sox affiliate to be so honored since Pawtucket won in 1990. Also honored this offseason was Tom Kotchman, the manager of the GCL Red Sox. Kotchman won the 2017 Tony Gwynn Award for his "lasting contributions to baseball." Kotchman got his first managerial gig back in 1979 at age 24 with the Auburn Redstars of the New York-Penn League. He worked for over 30 years in the Angels organization as a coach and scout before joining the Red Sox in 2014 as a scout and coach--then manager--of the Gulf Coast League club. Under Kotchman, the team won league championships in 2014 and 2015, giving him nine league championships since 1990. Among the many players to work under Kotchman is current Red Sox third baseman Rafael Devers, who hit .312/.374/.484 as a 17-year-old making his professional debut back in 2014. The negotiations for the next home of the Pawtucket Red Sox continue. A proposed plan that would keep the team in Rhode Island was submitted, but the city of Worcester continues to keep its name prominent. Governor Baker spoke highly of the plan with the Worcester Chamber of Commerce last week, and an official proposal is expected soon, per Bill Ballou of the Worcester Telegram. The Rhode Island Senate Finance Committee recently revised legislation that would change the allocation of any naming rights revenue. Kate Branson of the Providence Journal reports that the new arrangement would allow the city of Pawtucket to keep half of the revenue in order to pay its portion of debt related to the new stadium. The Red Sox organization, the SoxProspects staff, and the entire baseball community mourned the tragic death of 17-year-old Daniel Flores. Flores, a native of Venezuela, passed away on November 8 due to complications from treatment of a recently diagnosed, aggressive and rare form of testicular cancer, only two weeks after participating in the Fall Instructional League. Flores will appear as part of the SoxProspects.com homepage banner throughout the 2018 season.